RealPlayer Cloud, RealNetworks’s attempt to help you easily share videos across multiple devices and also revitalize its own fortunes as a company, is going global. On Monday, RealNetworks made its cloud-based video sharing service available worldwide after offering it in North America only for the last five months. RealPlayer Cloud works via Web browsers, on a variety of mobile devices running different OSes, and even on a few set-top boxes like Roku’s hardware. The service supports a variety of different video formats so that the video you share with friends and family is optimized for the screen size, bandwidth, and storage capacity of whatever device they’re using. TechHive’s hands-on with RealPlayer Cloud from back when the service launched in September 2013 found it to be an easy-to-use, secure way of sharing videos with others, if not exactly a revolutionary approach to video in the cloud. And since that time, RealNetworks has broadened out the service’s offerings, adding versions for Windows 8 and Amazon’s Kindle Fire as well as support for Google Chromecast. That’s helped RealPlayer Cloud grow its user base over the last five months. RealNetworks says a half-a-million people use RealPlayer Cloud in the U.S. and Canada. While that’s a drop in the bucket compared to the audience for other popular video-sharing offerings—Vimeo, for example, claims 22 million register members while YouTube welcomes 1 billion unique users each month—RealNetworks would counter that it’s not really competing with one-to-many sharing services. 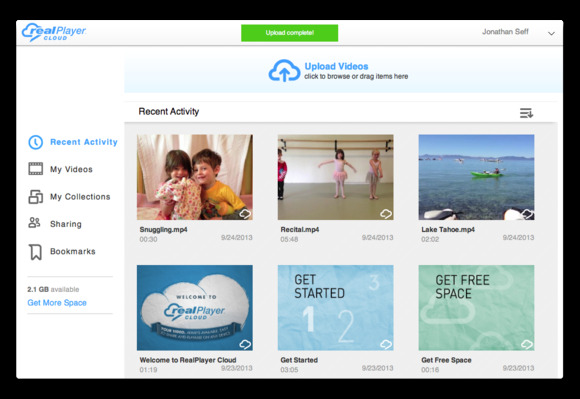 Rather, RealPlayer Cloud is looking to fill a person-to-person sharing demand—sort of a Dropbox or iCloud, but with a specific focus on video. Monday’s move should expand that user base of RealPlayer Cloud, not just by opening it up to users outside of North America but with a few other features designed to get the word out about the video-sharing service. RealNetworks announced a Refer-a-Friend feature that gives users 1GB of free space each time a friend of theirs creates a RealPlayer Cloud account. (You get 2GB of storage for free, with additional storage space available through subscriptions starting at $5 a month.) Also, the iOS and Android versions of RealPlayer Cloud can now send videos via SMS messaging in addition to email.